Wherever the differential pressure must be indicated locally and, at the same time, a signal transmission to the central control or remote centre is desired, the model DPGT43 intelliGAUGE® (US patent: 8,030,990) can be used. The electronic WIKA sensor, integrated into the model 732.14 high-quality, mechanical differential pressure gauge, combines the advantages of electrical signal transmission with the advantages of a local mechanical display. 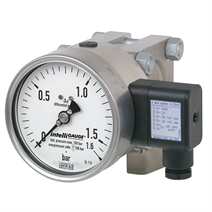 Even if the voltage supply is completely lost, the differential pressure can be read securely. The robust diaphragm measuring system produces a pointer rotation proportional to the pressure. An electronic angle encoder, proven in safety-critical automotive applications, determines the position of the pointer shaft – it is a non-contact sensor and therefore completely free from wear and friction. From this, the electrical output signal, proportional to the pressure, of 4 ... 20 mA, is produced. In addition, the electrical zero point can be set manually. These differential pressure measuring instruments are made of highly corrosion-resistant stainless steel. A high overload safety is achieved by the all-metal construction and the close-fitting design of the diaphragm pressure element. The use of high-quality stainless steel materials and the robust design are geared to applications in the chemical and process engineering industries. Thus the instrument is suitable for liquid and gaseous media, also in aggressive environments.